Were the Moon Missions Worth the Cost? Are Humans Doomed to Earth? My father had his 60th birthday recently. Every so often I hear a story from him about how “things have changed” in the U.S.. He likes to distill the “things” to emotions like hope, faith, exceptionalism; an innocence. I always ask for anecdotes. How have we “lost our way”? The meandering explanation leads to the Space Program. The story goes that the Apollo Program was the apex of space exploration. That losing the momentum of chasing a dream after shattering the need resulted in a slow-growing lethargy. Now, don’t get me wrong. My father loves America. He’s a veteran, he’s worked hard to bring the American Dream to my family his entire life. I don’t know if he’s right about how “things have changed”. Perhaps it’s just with time that we look back on history with rose-colored glasses. Nostalgia is a cloudy set of specs. Still, I can’t help but think of Norman Rockwell whenever the tale is spun. The family sits around the bubble-television watching on tenterhooks as the latest NASA mission is detailed. I can almost see my father there with a cowboy hat and a red wagon. “From the Earth to the Moon” by Norman Rockwell, 1969. This thought of “innocence lost in America” isn’t unique to my dad. My uncles and aunts love to chime in with agreement when they’re around. I can nearly hear someone holding back a “kids these days” comment. My family weren’t the first to think of this, either. In fact, “America lost its innocence”, verges on repetitive trope. I think it’s a loss of vision, a loss of priority. Is the U.S. Spending Enough on NASA, is Space Exploration a Priority? Perhaps there’s an argument to be had with space exploration. 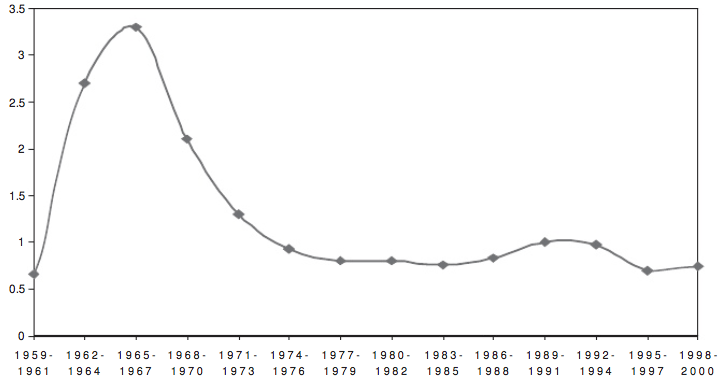 The U.S. isn’t spending like it used to. In the age of the Apollo Program, NASA’s portion of the federal budget hovered near 3% in some years. On average, NASA has cost about 1% of the federal budget. Space exploration, as a subset of NASA’s funding, is only a fraction of the U.S. federal budget. NASA funding is trending down. The 2015 budget request is for $17.5B, a bit less than 2014. It represents about 0.45% of the federal budget. $4B of that is dedicated to human space exploration. NASA is consistently underfunded, despite the fact that the public overestimates NASA’s cost. A 2007 study found that the average American thinks that we spend about 24% of our federal budget on NASA, or about 48x reality. NASA’s budget reality has been diverging from public perception for decades. It’s no wonder we have science celebrities panhandling to the public over half of a penny. Neil deGrasse Tyson delivers a powerful speech about a mindset in “We Stopped Dreaming”. A mindset where the average American would “think about tomorrow”. The idea that we, as a people, would look forward to technology advances; the possibilities unlocked from research and development. That humans were galvanized to dream about the future. A future in which we have invested for the long term. This isn’t a future guided by quarterly reports or election cycles. It’s one in which we are guided by improving the human condition. When the guiding light of exceptional goals is replaced with maintenance and status quo, dreams are shattered. The engineers, scientists, technologists, and mathematicians of tomorrow need to be led by the vision of exceptional goals. Without them, scientific progress stalls. Without a dream to pursue, we mortgage our future. The Apollo Program yielded an incredible return on investment. The U.S. had real, tangible gains from the investments made in the project. The program was a major stepping stone into future beyond Earth projects. Hardware developed during the Apollo era was used in Skylab, our first space station. Skylab produced valuable results through its solar observatory and experiments performed onboard. Skylab is just one of the spacecraft that would not have been feasible without knowledge from the lunar program. In 1975 a space docking with the Soyuz spacecraft occurred. It was a major step toward rebuilding relations between the U.S. and the U.S.S.R.. It played a key role in the end of the Cold War. A variety of breakthroughs in early breast cancer detection occurred. The accelerated development of integrated circuits was made possible through space exploration research. Several major spin-offs were the product of the lunar program. There are real benefits of space exploration. Tyson makes a point in his speech. Perhaps the one in which this entire story is based upon. He suggests that having a cultural mindset where the people are internally invested in the future enables those very people to bring the future to present. Perhaps that’s what my father means when he says “things have changed”. Maybe there’s solace in a place we wouldn’t have expected it. Traditionally, government has been the only source with the authority and resources to breach space. That might be changing. Can private entities with commercial needs exist within the vacuum of space? I found myself anxiously waiting in front of a screen for a launch countdown. I’d say I’m a fan of space exploration, but I’m not the type to sit around watching rocket launches. I regret not having seen a Space Shuttle launch before the program ended, though. However, this felt like something entirely different. 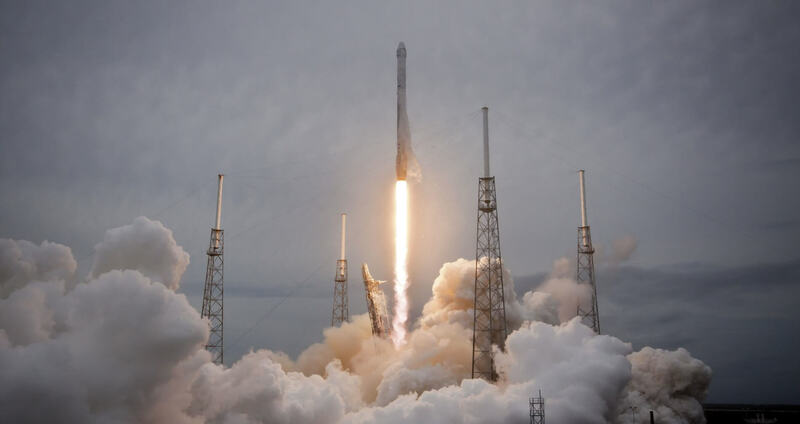 The Internet was awash in excitement for SpaceX’s Dragon spacecraft launch. It wasn’t just the geeks and nerds, either. Mainstream media had picked up the story and Elon Musk had become a celebrity. Musk founded SpaceX on the basis, eventually, Earth will no longer support our species. It’s a difficult concept to internalize as it’s an event far in the future, but it is inevitable. At some point, someone has to make the decision to spread humanity beyond Earth or our species dies with it. Across the globe, regular people were excited about space exploration again. My screen had less of a bubble shape to it than did my father’s during the first lunar missions, but I bet the feelings were similar. I watched the ground crew at SpaceX as Dragon completed its mission. You could see what Tyson had described in his video. I was inspired. The internalized goals, desire, and faith in the dream their project created was written all over the faces of the young talent at SpaceX. These engineers, scientists, technologists, and mathematicians were bursting with genuine excitement. They had a cause and a dream. It was excitement for the future. How will we move beyond the scope of the Apollo Program missions? SpaceX is doing a terrific job as a company, but to the general public, they’re little more than a goods transport service. A rocket-powered tractor-trailer. One which is primarily paid by a publicly funded NASA. There will undoubtedly be more: a tractor-trailer that can support humans, one which can travel further into the solar system, a system by which to deliver a payload to Mars. Ultimately, private companies will rely upon public funding to reach uncharted territory because there’s little reason for other private money to participate. As public interest and funding fades, so goes the revenue source of dependent private companies. If we haven’t made extending humanity beyond Earth a priority, one day, we’ll be forced off it. As much of a gift as Earth is, it will not last forever. If we can raise desire to go out and explore — to stretch our boundaries — we may be ready for whichever event forces us off before it happens. If we can find that awe in space exploration again, we may avoid sitting on the Earthly-Titanic, scrambling for a lifeboat. We can help by raising awareness in the benefits of space exploration: there are numerous NASA-supported inventions and advances already this year. We can help by telling our representatives space exploration deserves at least a penny on the dollar. And we can help expressing interest in space exploration with friends and through social media: the excitement spreads. It wasn’t a Saturn V or Shuttle launch, but I won’t forget watching the Dragon capsule’s first success. Humanity started down another possible avenue to expand among the stars. Not unlike my dad decades before, I sat by the screen watching and wondering in awe. All I needed was a cowboy hat and a red wagon. This post published in the American Astronautical Society’s “Space Times” Magazine July/August 2015 issue. This essay is a continuation of a post from 2009 detailing the Apollo space program cost. Give it a read if you liked this and consider sharing or commenting below! All SpaceX photos courtesy their public domain gallery.